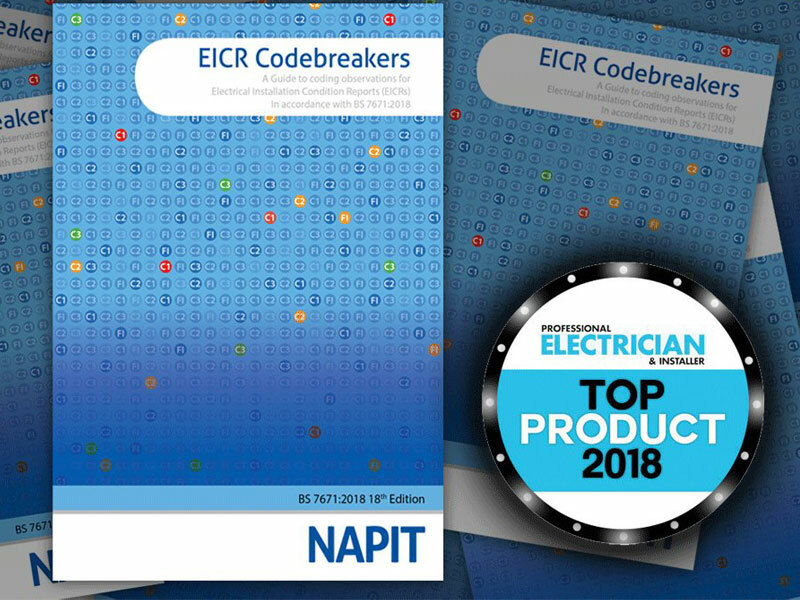 A winner of one of our prestigious 2018 Top Product Awards, NAPIT’s EICR Codebreakers publication has been updated to include the latest changes to the 18th Edition regulations. Gary Fisher of Lougar Electrical is our resident book-worm this month as he tries it out for size. If you fall into the category of those electricians who carry out Electrical Installation Condition Reports, I have a couple of messages for you: a) Good luck; and b) This publication from NAPIT is simply a ‘must-have’! When it comes to electrical works, undertaking EICRs must be one of the most awkward and frustrating jobs we experience. Not only are you more than likely to be not getting the right amount of money to carry one of these out (certainly in the right way with all the testing and inspecting that has to be carried out) but also as important is getting the codes correct for any items recorded. Over the years I’ve accumulated a fair amount of experience in this field, dealing with all kinds of customers that require an EICR. Of course they all want the word ‘satisfactory’ underlined for good measure on the certification. Those of you who do these will certainly know that this isn’t always the case and can sometimes end in an argument or, worst case, not getting paid at all. It’s at this point that you generally have to explain the reasons for the observations and recommendations, as well as the corresponding codes. That’s where this publication proves to be very useful indeed. Fully updated to the 18th Edition regulations, it’s published in a nice glossy A5 size which means it should be no problem to have it close to hand when carrying out an EICR, or filling out the test certification. One of the elements of the book that I really like is that it explains in detail the reasons for each coding. Additionally, you’re shown how to actually write a code (giving a clear description), and are provided with a regulation number to back up the description. The codes are also colour-coded, making it very quick and easy to see what code has been given to each example. Once you’ve gained an understanding of the code and subsequent colour, things are even easier to follow. The publication is split into six separate parts with sections under each one, so if you find yourself in a pickle about a certain observation and what code to use, it’s very easy to locate. 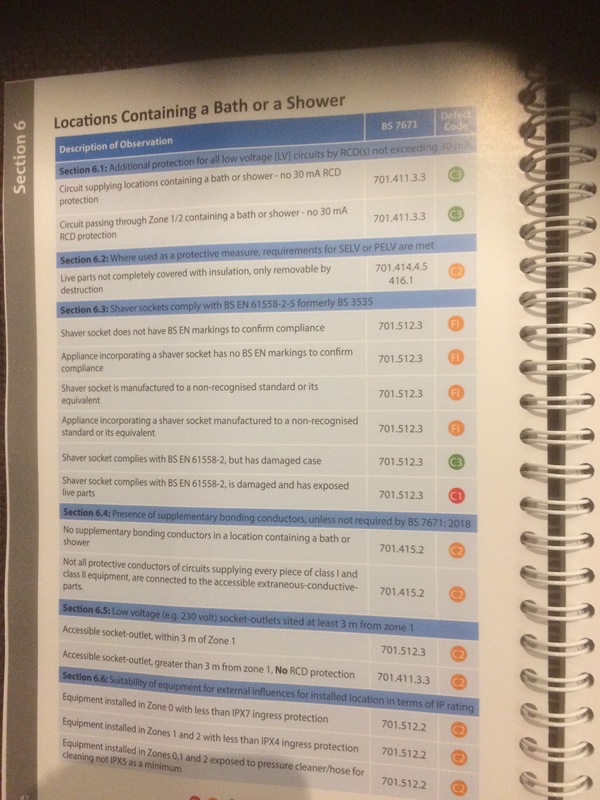 If, for example, you’re looking for a code related to a location containing a bath or shower, then Part 1 Section 6 is where you’ll likely find your answer. The interesting thing about Codebreakers is that it’s not just about codes and regulations, and actually contains some really useful nuggets of information, such as advice on testing of safety devices like RCDs, SPDs and AFDDs. It doesn’t stop there either, as what do you do about those items that don’t have a code? Again, you’re well stocked on this front as the book contains details of non-codeable observations. These are items that don’t have a particular regulation, but may in some way affect the existing electrical installation and, as a result, are worth a note at minimum because they full outside the scope of BS 7671. A fine example of this is can be found on those occasions where you’re siting socket outlets close to sinks – but what are the minimum distances, heights from work tops etc. supposed to be? And how many electricians know the correct procedures for safe isolation on domestic or other types of installations? In my experience not as many as there should be, but it’s all there in this book as well. So I’m guessing that you can probably tell by now that I’m a big fan of Codebreakers and now take it with me to any jobs that require an EICR to be carried out. I now feel confident of wording observations in a much more organised, professional and accurate way, thus adding more useful detail to my reports. Each observation recorded is self-explanatory and this ensures I don’t have to have long conversations with the customer about what they may all mean. Furthermore, it’s just a very interesting read – containing lots of interesting facts about testing and inspection. If and when you eventually arm yourself with a copy of this book, I’d recommend that you take a little bit of time to read through it and familiarise yourself with the sections/content as this will make things a lot quicker and efficient for you when it comes to looking up the information you require during an EICR. As far as I’m aware there’s no other publication available that offers this type of useful coding information – of course you’ve always got the option to look online, and check things like forums etc. but nothing where the codes are all housed in the same location. My overall assessment is that this is a truly outstanding publication, and the folk at NAPIT deserve great credit for producing something that genuinely assists the contractor with this area of their work. 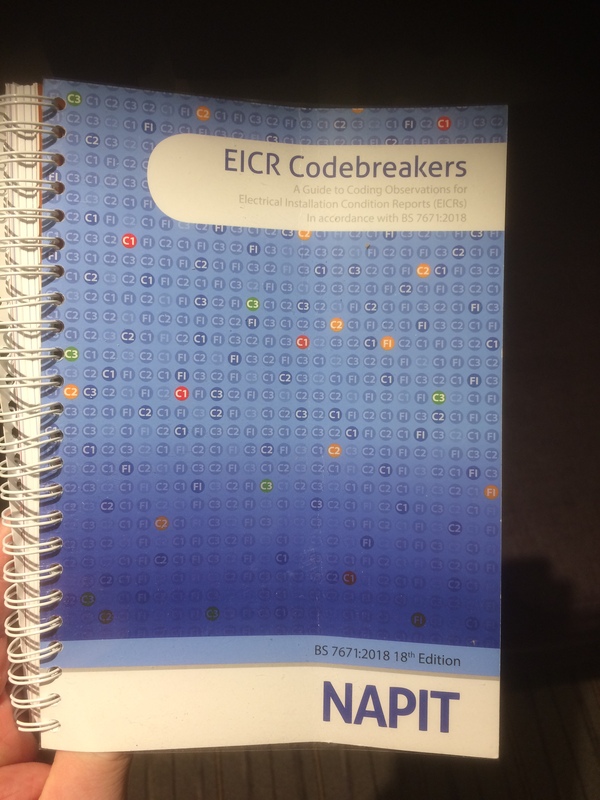 There’s absolutely no doubt in my mind that if you carry out EICRs regularly then you should be getting your hands on Codebreakers as soon as possible, as it tells you everything you need to know about coding and more. It’s also very useful for organisations like letting agents as it can help them to better understand what the EICR means and the implications regarding the electrical installation. Personally, I now don’t leave home without it! Next : Lighting: How Do We Solve The Productivity Puzzle?